Chelsea manager Jose Mourinho has been fined £10,000 for comments he made after his side's Premier League game against Sunderland on 19 April. 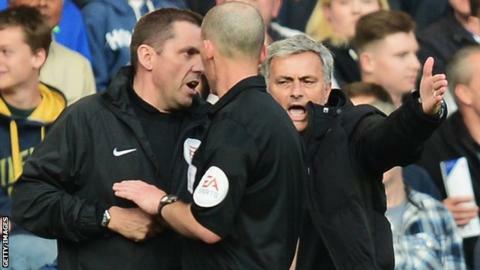 Mourinho, 51, "congratulated" referee Mike Dean after Chelsea had been beaten 2-1 at Stamford Bridge. A Football Association statement said his comments "brought the game into disrepute" and the Portuguese was guilty of a charge of improper conduct. Mourinho also lost an appeal regarding an £8,000 fine for another offence. He had denied his actions during the 1-0 Premier League loss at Aston Villa on 15 March, which saw him approach referee Chris Foy and try to speak to him before being sent to the stands, were a breach of FA rules. But an independent regulatory commission said Mourinho was guilty of improper conduct and that verdict has been upheld by an appeal panel. Mourinho lost his 77-match unbeaten home record in the Premier League to Sunderland, and the defeat proved costly in Chelsea's bid to win the Premier League title. Following the defeat, which saw his assistant Rui Faria sent to the stands and later given a six-match stadium ban, Mourinho congratulated his Chelsea players, Sunderland and then the officials. But he refused to answer questions from the media, instead making a statement. He described Dean's performance as "unbelievable" and "fantastic", before moving on to referees' chief Mike Riley. "What they are doing during the whole season is fantastic, especially in the last couple of months, especially in matches involving the teams that were in the title race," said Mourinho. "It's absolutely fantastic". Mourinho's Chelsea side are third in the Premier League with one game of the season remaining.